I just received my Fathers Day present. After a few months of listening to reviews and weighing my options in the personal locater beacon market, I decided to get a SPOT satellite personal tracker/messenger. 4. 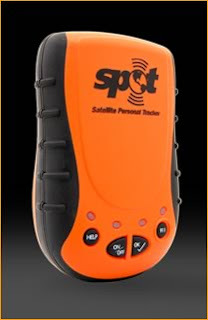 "Spot Casting" - A GPS report, every 10 minutes, that is viewable using a Google Map web site. The messages go to my contacts (as many as 10) using SMS to their cell phones or email. The SPOT website lists all the specs, but the reasons I went with the SPOT was its price ($150) and low subscription fee for the services. In addition, a year of GEOS Search & Rescue Benefit for $7.95/yr USD (if purchased at initial activation. $150.00 USD afterwards) provides up to $100,000 USD of additional search and rescue resources, including helicopter extraction around the world and reimbursement benefits – underwritten by Lloyd’s of London – for any emergency service expenses incurred. For more information, including terms and conditions, visit http://www.geosalliance.com/sar. Needless to say, this unit is a convenience to signal I'm down OK when cellphone service isn't available, and a necessity, should I ever need a rescue. Cheap insurance, in my opinion. I made the long drive to Potato Hill this weekend to tune up my head and my gear for the upcoming summer comp season. The weather was calling for a high pressure with high valley temps but my XC skies forecast was showing good lift to 11000 to 12000'. The turnout was very good with 20-25 pilots crammed into the launch area. It was hot enough that when I saw any likelihood that I would find a climb, I launched. I explored the area for 45 minutes before the start & tried to map the best lift sources. I had only one local flight at Potato Hill before this weekend, so I was watching some pilots who had flown the area before. I flew with Tom before the start & we headed over to the start cylinder at SNOLO with 10 minutes to the start. We searched in vain for the thermal we had climbed in earlier and had to grovel back to the launch to climb back up for a late start. It was frustrating to blow the start that badly, but we made good time after the start and it was a long task so we weren't too stressed. We made the obligatory short valley crossings and then headed out on the long leg to Paskenta. We joined Eric B. on his new IcePeak and team flew for 15 miles or so. 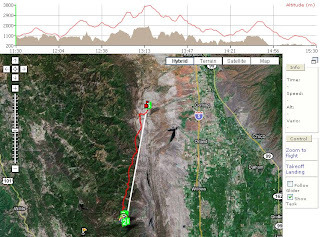 We really had to switch gears when the climbs over the low ground became 200-300 fpm and topped out at 7000'. As we approached Paskenta we each took a different line. Eric, with the extra glide on his comp wing, was able to glide to the turnpoint high enough to find a bubble that got him up a bit. Tom headed in on a death glide to the TP and floated along at 300-400' agl (and in 90* temps) for a kilometer or so before landing. I took a line West of the turnpoint to fly a rocky escarpment about 1000' tall. I hit it with about 500' of clearance and immediately found a nice thermal that put 1000' in the bank before breaking up. I considered hanging around the spot until it cycled again, but Eric was going up right over the turnpoint so I made for the cylinder. By the time I got there Eric was up & gone so I tagged to point, moved to some low hills & hoped for some help. I overflew Tom & made a couple kilometers before landing in a grassy field. Altogether I flew about 78 kilometers (48 miles) and placed 5th or 6th for the day. Sunday the temps were a little cooler and we all got to launch earlier that Sat. About 10 pilots were unable to launch on Sat. due to a convergence that brought the wind over the back and shut down the launch. Needless to say, noone wanted to get stuck on launch in the heat today. A short task was called with a couple of valley crossings and then a straight shot over Indian to Stoneyford. I launched early again and flew around for 30 minutes before getting into the leader gaggle. I had a good start but didn't like the way the guys looked as they crossed to HAPPY. I turned to get a higher climb over Snowy Mtn. and this put me about 7 minutes behind the leaders, but higher than them so the real impact was only 3-4 minutes. I considered this a good trade that early in the task since some pilots were sinking out in the valley. I joined up with Jug & Will (on my Aspen2 - he's buying it) and Tom to fly the last 10 miles of the 20 mile task. I missed one good climb & lost Tom but was able to feel the exhilaration of driving to goal on full bar watching the GPS "L/D required to goal" teeter between failure and success. There was a general store across the street from the goal so we all indulged in beverages. It reminded me of the Australian tasks I flew that terminated at a goal field across from a pub. In all, the weekend went very well. We had one pilot get stuck in a bad spot and he had a hard landing with some spinal compression, but it sounds like he has a good prognosis for recovery. Personally, I'm happy with the outcome of the weekend but I made some glaring mistakes and am still amazed how quickly I fall behind the 'big-boys' as they charge off on course. I have a lot of room to improve my technique. 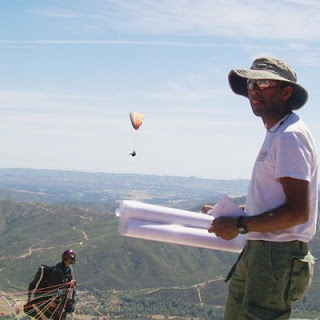 The weekend of May 3-4 I headed to Santa Barbara to attend a Paragliding Competition Clinic put on by Rob Sporrer at Eagle Paragliding in Santa Barbara. Josh Cohn & Dean Stratton, both US Nat'l Champions, were the instructors. I didn't really know what to expect from a clinic of this type, but I hoped to get some info that would help me get consistent finishes. Josh & Dean are not only great pilots. They also are great guys who are generous with their time & knowledge. The class consisted of 5 pilots. Most had not competed in any comps so the GPS and navigating the course were the emphasis. The first day we covered some of the basics and called a task at Marshall (San Bernardino). We continued to talk during the 2.5 hour drive to the site. I'd never flown at Marshall before and looked forward to the new site. When we arrived at launch it felt a bit brisk but lower on the launch it felt reasonable between thermic cycles so Josh launched first to check conditions. He reported back that things were OK so I suited up & was soon climbing to 6000'. The course was around 25km with a 3pm start time. I managed a good start & flew around the course. The conditions were great & some of the climbs were the best I've seen since last Summer. My flight is HERE. More photos of the group are HERE. I learned a lot and spent time talking & flying with guys that have skills I hope to someday develop. The grin you see on my face in the photo above says it all - Thanks to Josh Cohn for the pics. A good couple of days.